Getaway to Cavallo Point with Specials for Spa Lovers and Girlfriends! The newly opened Cavallo Point Lodge at the Golden Gate is the San Francisco Bay area’s first national park lodge. It also happens to be gorgeous! The Healing Arts Center & Spa, an 11,000 square foot wellness center at Cavallo Point, is now offering two special packages designed to appeal to the spa and wellness enthusiast. The Spa and Wellness Package includes two nights in a Golden Gate Jr. Suite; one Eco Facial per person and each guests’ choice of either the Cavallo Signature Massage or the Organic Massage; daily breakfast for two at the Murray Circle restaurant; and parking. The two-night package is $1,400, double occupancy. For an extra $700, add another night plus one treatment per person, breakfast and parking. The Girlfriends’ Getaway Package includes two nights in a Bayside Two-bedroom suite or the Frank House, a two-story, two-bedroom restored house with its own kitchenette. The deal also includes a chilled bottle of champagne upon arrival; one Eco Facial per person, and each person’s choice of either the Signature Massage or the Organic Massage; breakfast at Murray Circle; overnight parking. Package is based on double occupancy and is priced at $1,650, with additional nights available for an extra cost. The packages are available until May 31, 2009, excluding December 24-31, and don’t include taxes or gratuity. 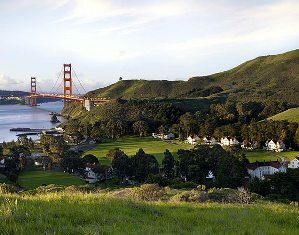 Check out Cavallo Point to book and for more information on the resort. Amazing… my girlfriend thought of this last weekend on a lark, and we headed out there. I am still not focused at work, surfing and looking at pics, and that’s how I found this. That place… is.. simply… unreal. I might need a frequent massage card cause I am going back soon!! !